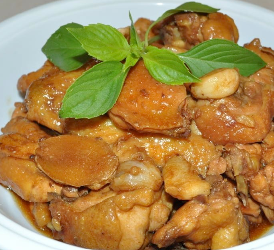 The dish is made by simmering chunks of chicken in wine, soy sauce and herbs until the meat is flavorful and tender. Of the ingredients in this recipe, the sesame oil, soy sauce and rice wine are key. 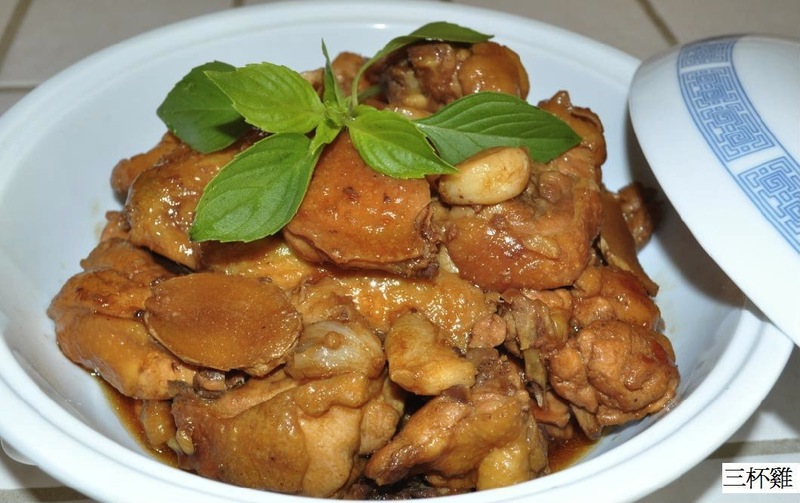 If desired, the recipe can be used not only to cook chicken, but also squid, tofu and vegetables. Clean the chicken and cut into 2″ x 2″ chunks. Heat sesame oil in a deep pan over medium heat, and sauté ginger and garlic until fragrant. Add chicken to the pan and stir fry until the meat turns pale. This should take approximately 4 to 5 minutes. Add soy sauce, wine and sugar to the pan and cover the dish with a lid. Cook over medium-low heat until liquid is mostly absorbed. Add basil and stir fry for another minute. Serve the chicken in the clay or ceramic pot. There is no need to smash the garlic cloves; they will become very soft and flavorful after cooking. Note that a clay or ceramic pot is best for maintaining food temperature in this recipe.